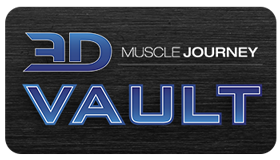 I would like to think that 3DMJ has played a large role encouraging bodybuilders to focus on getting stronger, organizing their training more effectively, utilizing compound movements to efficiently train multiple muscle groups simultaneously, and to see lifts as skills to master. Many of these approaches are common place in powerlifting, yet historically are absent in many bodybuilding circles. When we first formed 3DMJ, it was shockingly common to see bodybuilders train in haphazard ways and do things that were detrimental to progress. Using an extremely high variety of often redundant lifts and changing them every session, focusing solely on the feel and ignoring quantifiable progress, purposely avoiding certain compound lifts and super setting, drop setting, using partial range of motion or forced reps to the point where tracking progress became impossible, were all frequent sights. We used our successes as both athletes and coaches, in powerlifting and bodybuilding, to increase the awareness of these blind spots and to improve the quality of training present in the community. However, as with all things in the fitness industry (and society in general), a substantial portion of people looked at this in black and white terms; upon learning bodybuilding and powerlifting training weren’t complete opposites like they previously believed, they started to think they were synonymous. It wasn’t long before every other young bodybuilder had Romaleos, Rehbands, a 13-inch lever belt, wrist wraps, and was posting videos of their 1RM’s before starting a blended version of Sheiko CMS and Smolov Jr for bench. Fast forward a couple years later to present day, and the inevitable is happening (as it always does): the pendulum of public opinion is swaying back the other direction and posts about injuries and underdeveloped calves, biceps and hamstrings, all due to powerlifting abound. Now, at this stage of the article you’re probably trying to figure out whether I am pro powerlifting style training for bodybuilders, or anti powerlifting style training for bodybuilders. If it’s true that’s what you are wondering, stop for a second, take your hand, and smack yourself right in the face. Good, nice work. With that out of the way, try to remember that this “either or” type of thinking is what got us into trouble in the first place. There is no debate that a ton of good things have come from powerlifting’s influence. However, there is also no debate that many bodybuilders became convinced they had to back squat, bench press, deadlift and get incredibly strong to make optimal progress…which not only isn’t the case, but can be harmful. So, what are the actual lessons to be learned from powerlifting? What do we know is beneficial, what do we know is counterproductive, and what don’t we know yet? 1. Progressive Tension Overload – mechanical tension is a key component to muscular hypertrophy (19). Progressing that tension to ensure continual adaptation is the key to continued growth (9). One of the easiest ways to do this is lifting heavier loads as you get stronger in your training. 2. Higher Frequency – a 2013 survey of 127 male competitive bodybuilders found that ~2/3rds trained each muscle group only once per week with a high volume, high intensity approach (10). However, there is now a large body of evidence showing that well trained strength athletes and bodybuilders might grow faster spreading their volume over 2+ training sessions per week per body part, possibly because it preserves the global quality of performance and manages fatigue more effectively (11, 12, 16, 21, 26). 3. Compound Exercises – in untrained lifters, adding single joint exercises to a twice per week program of doing only compound exercises provides no additional measurable hypertrophy after being observed for 10 weeks (7, 8). In lifters with at least 2 years experience, there is not as much of a difference as you might expect between doing compound movements only or adding additional isolation work, and the effectiveness of doing so is quite variable between individuals (4). Most of your growth in a program containing compound and isolation exercises is due to the compound movements. 4. Longer Rest Periods – decreasing rest periods too far can decrease the number of repetitions performed on subsequent sets (5). Given the clear relationship between number of sets performed and hypertrophy (15), it should be no surprise that resting for too short of a period between sets can hamper growth (2, 18). 5. Mastering Movements – Unlike simple isolation exercises, compound exercises effectively produce hypertrophy only after you have adequately learned the motor pattern (3). Thus, mastering these movements and not introducing excessive variation will likely produce greater gains. 1. Only Lifting Heavy – When volume is similar, heavy and light loads produce similar hypertrophy but heavier loads produce more strength (14, 22). But, it takes much longer to complete multiple sets of heavy loads with an appropriate rest interval (14, 22). Consider how long it would take you to do 8 sets of 3 reps with 90% of 1RM, compared to 3 sets of 10 reps with 72%. The volume would be identical, but it would take much longer to perform the former. If the number of sets is the same (3x3x90% vs 3x10x72%), the time required is similar, but strength is still greater lifting heavy. However, growth is not as high when lifting heavy in this case as volume is much lower (20). 2. Too Little Exercise Variation – Just like doing too much exercise variation can be problematic, so can doing too little. Some muscles are not effectively trained by the big 3 like the lats, calves, biceps, short head of the biceps femoris, and the rear delts. Beyond that, muscle architecture is complex to allow movement in a near infinite number of ways. Thus, muscle activation changes depending on grip, body position, joint angle, exercise modality, and plane of motion (1). Subsequently, the region of a muscle that grows is the same region that activates during a certain movement variation (25). Therefore, it should be no surprise that training with only a single leg exercise, even with the same number of total sets, produces similar global, but less uniform hypertrophy compared to using four lower body exercises (6). 3. Only Heavy Lifting with High Risk Movements – the combination of point one and two is more than likely the cause of a higher injury rate among powerlifters compared to bodybuilders. Recreational bodybuilders experience injuries at a rate of 1 injury per 1000 training hours, while competitive bodybuilders experience injuries at a rate of 0.24 injuries per 1000 hours (23). On the other hand, powerlifters experience injuries at a rate of 1 to 4.4 injuries per 1000 hours depending on the study consulted (13, 17, 24). 1. ANTONIO J. Nonuniform Response of Skeletal Muscle to Heavy Resistance Training: Can Bodybuilders Induce Regional Muscle Hypertrophy? The Journal of Strength & Conditioning Research 14: 102-113, 2000. 2. Buresh R, Berg K, and French J. The effect of resistive exercise rest interval on hormonal response, strength, and hypertrophy with training. Journal of strength and conditioning research 23: 62-71 2009. 3. Chilibeck PD, Calder AW, Sale DG, and Webber CE. A comparison of strength and muscle mass increases during resistance training in young women. European journal of applied physiology and occupational physiology 77: 170-175, 1998. 4. de Franca HS, Branco PA, Guedes Junior DP, Gentil P, Steele J, and Teixeira CV. The effects of adding single-joint exercises to a multi-joint exercise resistance training program on upper body muscle strength and size in trained men. Applied physiology, nutrition, and metabolism = Physiologie appliquee, nutrition et metabolisme 40: 822-826, 2015. 5. de Salles BF, Simao R, Miranda F, Novaes Jda S, Lemos A, and Willardson JM. Rest interval between sets in strength training. Sports medicine (Auckland, NZ) 39: 765-777, 2009. 6. Fonseca RM, Roschel H, Tricoli V, de Souza EO, Wilson JM, Laurentino GC, Aihara AY, de Souza Leao AR, and Ugrinowitsch C. Changes in exercises are more effective than in loading schemes to improve muscle strength. Journal of strength and conditioning research 28: 3085-3092, 2014. 7. Gentil P, Soares S, and Bottaro M. Single vs. Multi-Joint Resistance Exercises: Effects on Muscle Strength and Hypertrophy. Asian J Sports Med 6: e24057, 2015. 8. Gentil P, Soares SR, Pereira MC, Cunha RR, Martorelli SS, Martorelli AS, and Bottaro M. Effect of adding single-joint exercises to a multi-joint exercise resistance-training program on strength and hypertrophy in untrained subjects. Applied physiology, nutrition, and metabolism = Physiologie appliquee, nutrition et metabolisme 38: 341-344, 2013. 9. Goldberg AL, Etlinger JD, Goldspink DF, and Jablecki C. Mechanism of work-induced hypertrophy of skeletal muscle. Medicine and science in sports 7: 185-198, 1975. 10. Hackett DA, Johnson NA, and Chow CM. Training practices and ergogenic aids used by male bodybuilders. Journal of strength and conditioning research 27: 1609-1617, 2013. 11. Hartman MJ, Clark B, Bembens DA, Kilgore JL, and Bemben MG. Comparisons between twice-daily and once-daily training sessions in male weight lifters. International journal of sports physiology and performance 2: 159-169, 2007. 12. Helms ER, Fitschen PJ, Aragon AA, Cronin J, and Schoenfeld BJ. Recommendations for natural bodybuilding contest preparation: resistance and cardiovascular training. Journal of Sports Medicine and Physical Fitness 55: 164-178, 2015. 13. Keogh J, Hume PA, and Pearson S. Retrospective injury epidemiology of one hundred one competitive Oceania power lifters: the effects of age, body mass, competitive standard, and gender. Journal of strength and conditioning research 20: 672-681, 2006. 14. Klemp A, Dolan C, Quiles JM, Blanco R, Zoeller RF, Graves BS, and Zourdos MC. Volume-equated high- and low-repetition daily undulating programming strategies produce similar hypertrophy and strength adaptations. Applied Physiology, Nutrition, and Metabolism 41: 699-705, 2016. 15. Krieger JW. Single vs. multiple sets of resistance exercise for muscle hypertrophy: a meta-analysis. Journal of strength and conditioning research 24: 1150-1159, 2010. 16. McLester JRJ, Bishop E, and Guilliams ME. Comparison of 1 Day and 3 Days Per Week of Equal-Volume Resistance Training in Experienced Subjects. Journal of strength and conditioning research 14: 273-281, 2000. 17. Raske A and Norlin R. Injury incidence and prevalence among elite weight and power lifters. The American journal of sports medicine 30: 248-256, 2002. 18. Schoenfeld B and al. E. Longer inter-set rest periods enhance muscle strength and hypertrophy in resistance-trained men. Journal of strength and conditioning research [Epub ahead of print], 2015. 19. Schoenfeld BJ. The mechanisms of muscle hypertrophy and their application to resistance training. Journal of strength and conditioning research 24: 2857-2872, 2010. 20. Schoenfeld BJ, Contreras B, Vigotsky AD, and Peterson M. Differential Effects of Heavy Versus Moderate Loads on Measures of Strength and Hypertrophy in Resistance-Trained Men. Journal of sports science & medicine 15: 715-722, 2016. 21. Schoenfeld BJ, Ratamess NA, Peterson MD, Contreras B, and Tiryaki-Sonmez G. Influence of Resistance Training Frequency on Muscular Adaptations in Well-Trained Men. Journal of strength and conditioning research 29: 1821-1829, 2015. 22. Schoenfeld BJ, Ratamess NA, Peterson MD, Contreras B, Tiryaki-Sonmez G, and Alvar BA. Effects of different volume-equated resistance training loading strategies on muscular adaptations in well-trained men. Journal of strength and conditioning research 29: 2909-2918, 2014. 23. Siewe J, Marx G, Knoll P, Eysel P, Zarghooni K, Graf M, Herren C, Sobottke R, and Michael J. Injuries and overuse syndromes in competitive and elite bodybuilding. International journal of sports medicine 35: 943-948, 2014. 24. Siewe J, Rudat J, Rollinghoff M, Schlegel UJ, Eysel P, and Michael JW. Injuries and overuse syndromes in powerlifting. International journal of sports medicine 32: 703-711, 2011. 25. Wakahara T, Fukutani A, Kawakami Y, and Yanai T. Nonuniform muscle hypertrophy: its relation to muscle activation in training session. Medicine and science in sports and exercise 45: 2158-2165, 2013. 26. Wernbom M, Augustsson J, and Thomee R. The influence of frequency, intensity, volume and mode of strength training on whole muscle cross-sectional area in humans. Sports medicine (Auckland, NZ) 37: 225-264, 2007. I did not realize that have a short rest periods is not a good tactic. I usually start the next set as soon as I catch my breath which does not allow enough time for me to be ready to accomplish the required reps.